Mums will always be requisite in the fall garden, but how about adding the bold colors of Japanese maples, the bright red berries of hollies or the elegant flowers of shade-loving toad lilies? With so many autumn plants to choose from, it’s easy to add more than mums to your fall garden. 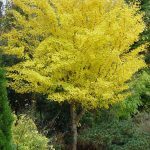 Ginkgo is an ancient tree native to China that is practically maintenance-free once established. Its fan-shaped leaves bring lovely texture to the garden and its golden yellow fall color is unparalleled. The carpet of color after the leaves drop adds to the beauty of the plants below it. Be sure to plant a named male cultivar to avoid the large, malodorous fruits of the female tree. 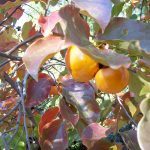 This small, low branching tree makes a worthwhile specimen in the ornamental landscape and a tasty addition to the orchard. In autumn its long green leaves turn striking shades of yellow, orange and red. After leaf drop, the tree is filled with large, showy and sweet red-orange fruits. Where to grow: Full sun, moist but well-draining soil. 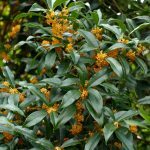 This attractive evergreen shrub may not always have the showiest flowers, but once our nights begin to cool in September the small white, yellow or orange clusters create an irresistible, citrusy-sweet scent. It’s most floriferous in fall but will also bloom in spring and sporadically in summer. 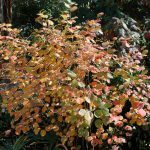 This cultivar of the native Fothergilla has it all – interesting, slightly contorted stems; fragrant, showy and large white flower spikes in spring; and consistently stunning fall color as the bluish-green leaves turn various shades of orange and red. What’s not to love? No garden should be without our native beautyberry! 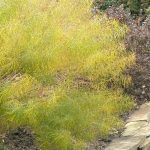 Its arching habit lends a graceful form to the mixed border, and it can be pruned hard in late winter to keep it in bounds for smaller gardens. Small pink flowers appear in summer, followed in fall by a profusion of large clusters of violet-purple berries. C. dichotoma albifructus is smaller with white berries. This southern native is one of the toughest yet most delicate looking perennials you’ll find. Its upright to arching habit and feathery foliage adds flowing texture in the garden. Bluestar gets its name from the star-shaped, sky-blue flowers that cover it in spring, and the plant holds its good looks in the dry hot summer. The golden yellow fall color is nothing short of stunning and a beautiful backdrop to other fall-flowering plants. And it’s deer resistant! 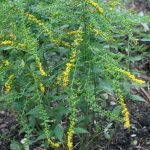 Come fall, when other flowers have long since faded, this native perennial literally explodes with color as the fiery yellow flowers branch out in all directions from the upright stems. Butterflies and other pollinators appreciate the tasty nectar, and the seeds provide food for finches, sparrows and other birds. 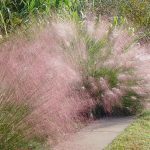 Ornamental grasses in the garden have gained in popularity in recent years and for good reason. 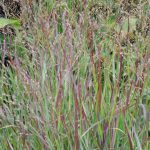 ‘Shenandoah’ Red Switchgrass is a native prairie grass that provides almost year round interest. 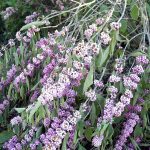 The tips of its upright green leaves are tinged with reddish purple in summer, and the cool of autumn turns the whole plant a dark and dramatic reddish purple with a mist of pink plumes above. It’s drought tolerant and well behaved, too. Whether planted en masse in a natural area or placed in the mixed border, this grass is hard to beat for fall beauty. During the spring and summer it can get lost in the garden, but in fall it is a show-stopper. 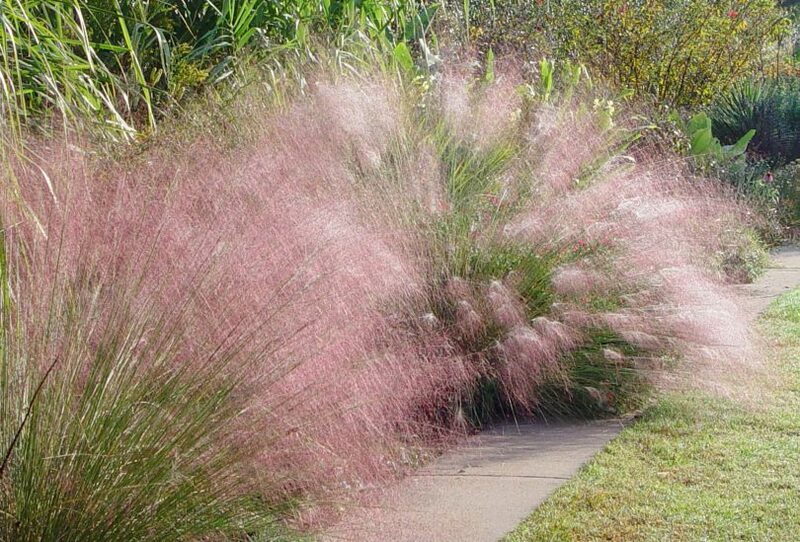 The upright clump is covered with an almost ethereal cloud of dark pink to purple plumes. This native grass can thrive even in the poorest of soils. 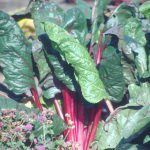 This cool season annual with its bright red stems and crinkly, dark green and red leaves brings bold color and high power impact to the fall landscape, vegetable garden or container plantings. Both the stems and the leaves are edible and packed with nutrients.